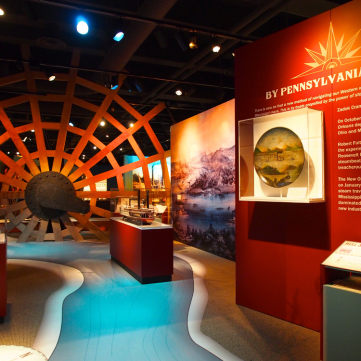 Travel back in time to when Pittsburgh was the Gateway to the West with the History Center’s new major exhibition, Pittsburgh’s Lost Steamboat: Treasures of the Arabia. 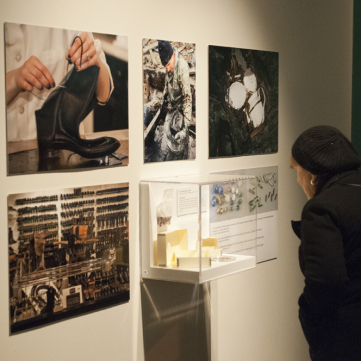 By popular demand, the exhibit has been extended until Jan. 11. Visit today! 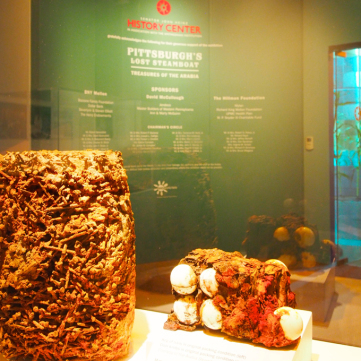 Explore an era when Pittsburgh was the steamboat center of America. 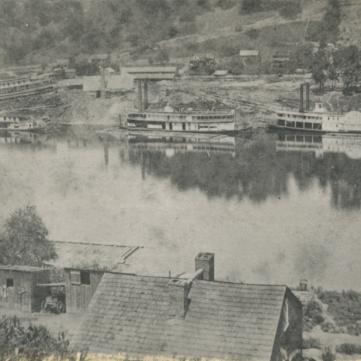 The Arabia, built in the famed Pringle boatyard in Brownsville, Pa. and launched in Pittsburgh in 1853, was one of hundreds of steamboats that began life in the boat yards along the Monongahela and Ohio rivers. 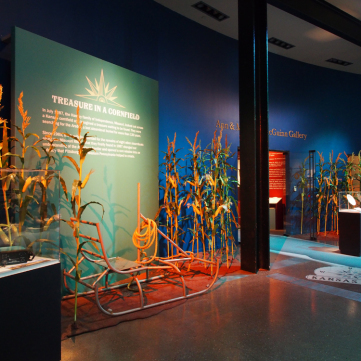 Sunk in the Missouri River in 1856 and sealed in an oxygen-free environment, the Arabia became a remarkable time capsule when she was rediscovered 150 years later by a group of modern-day treasure hunters deep below a Kansas cornfield. 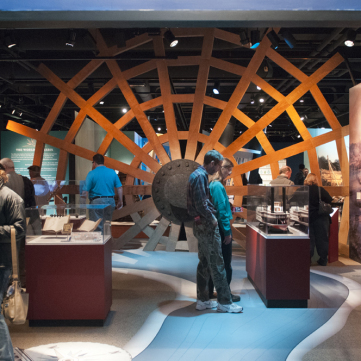 Join History Center President and CEO Andy Masich on a guided tour of the Treasures of the Arabia exhibition. The Arabia ran on the Ohio River for two years before owners sold her to Missouri interests in May 1855. The boat ended up on the Missouri River just as thousands of new settlers were heading west to the Kansas-Nebraska frontier. After surviving multiple trips on the treacherous Missouri—including an attempt to smuggle guns into Kansas for the antislavery cause—the Arabia struck a tree snag and sank near Kansas City, Mo. during its final journey in September 1856. 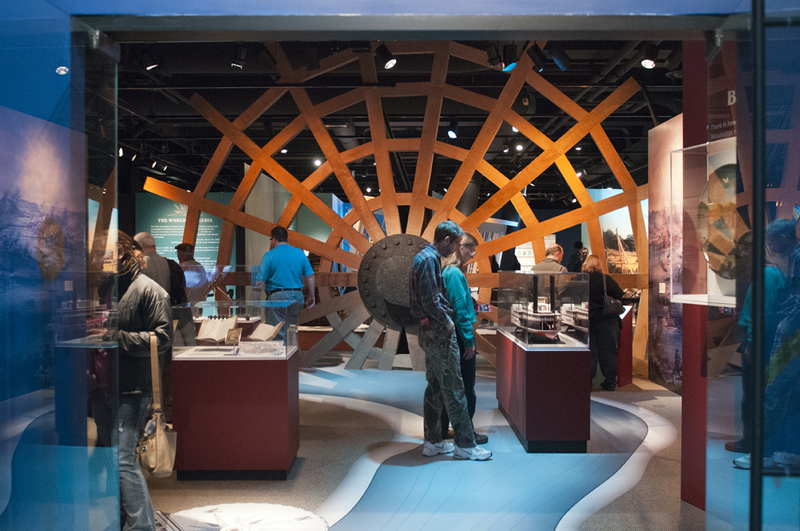 Packed with nearly one million objects, the boat gradually disappeared into the muddy bottom of the Missouri. 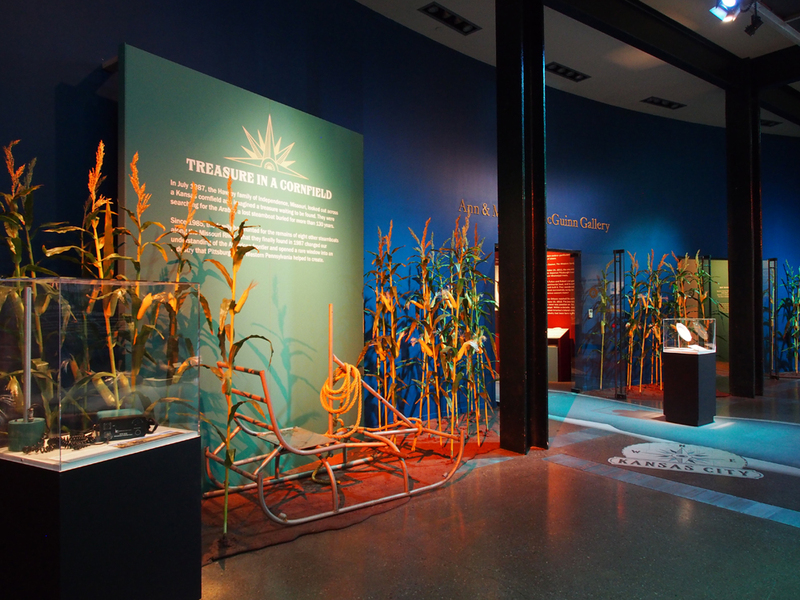 As the years passed, the river changed course, leaving the Arabia buried 45 feet below a cornfield in what is now part of Kansas. 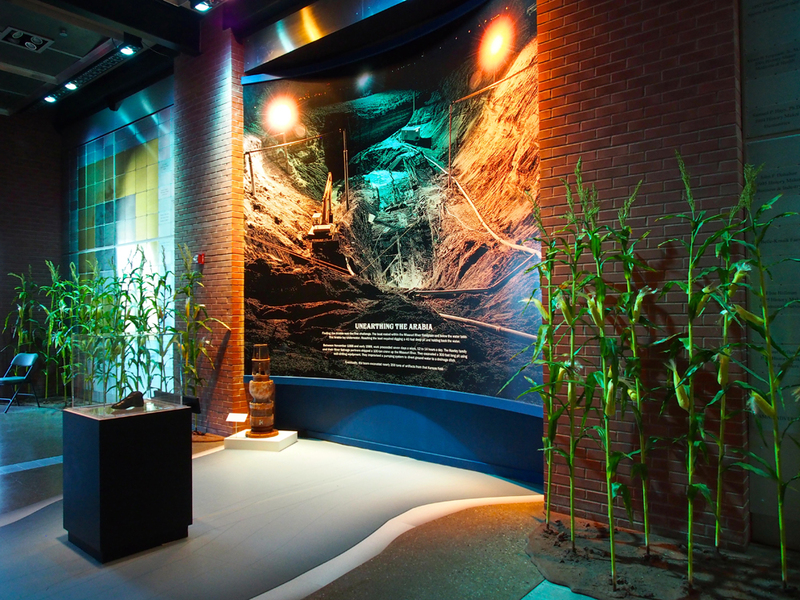 Sealed in an anaerobic (oxygen-free) environment, the Arabia’s frontier cargo remained perfectly preserved until the boat was unearthed in the late 1980s. Now you can explore that discovery for yourself. 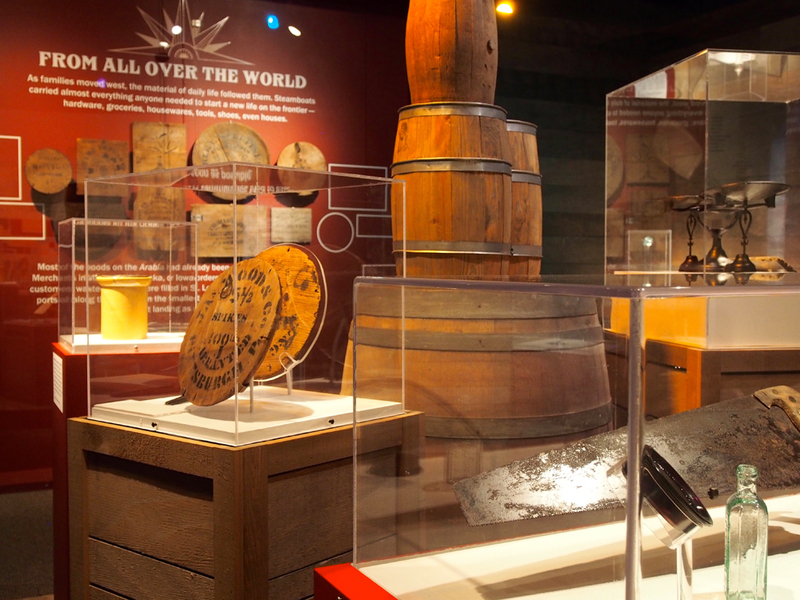 Pittsburgh’s Lost Steamboat: Treasures of the Arabia features nearly 2,000 artifacts, including everything from coats and boots to fine china and a jar of 160-year-old pickles, still looking fresh and green, all in an immersive museum environment ideal for visitors of all ages. 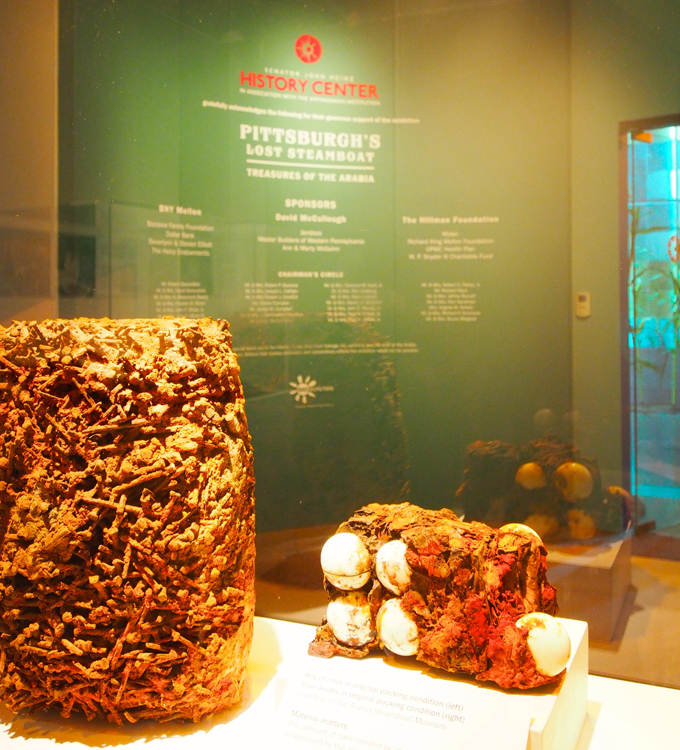 Hop aboard to enjoy the largest time capsule of pre-Civil War items ever discovered as part of Pittsburgh’s Lost Steamboat: Treasures of the Arabia. 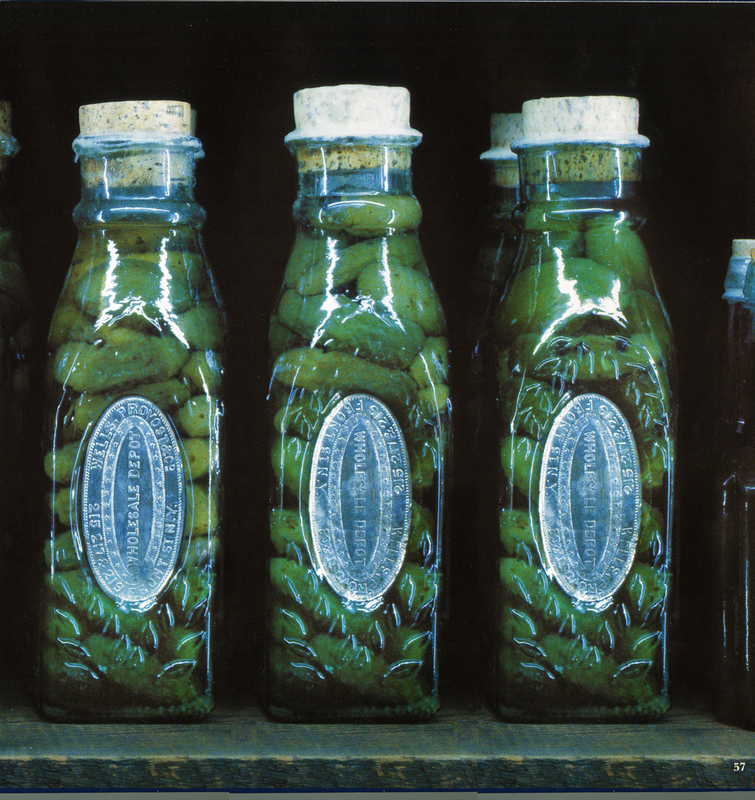 Along with dry goods and building supplies, the Arabia’s cargo included a wide variety of canned and bottled food like these pickles, still preserved after more than 160 years. A jar of pickles from 1856, still intact after more than 160 years. 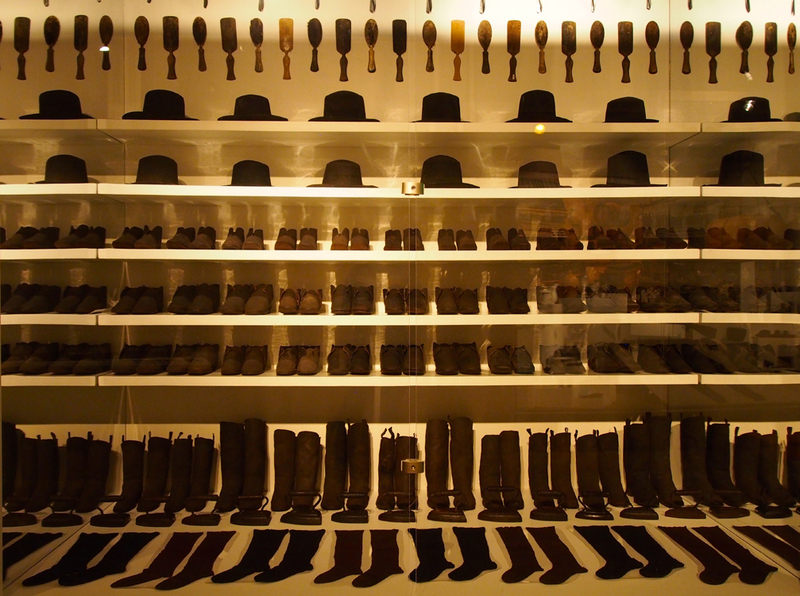 Wool shirts, hats, and a pair of plaid pants, all destined for frontier stores in 1856. A rare Sharps Model 1853 Carbine and Ames bayonet, seized on the Arabia while being smuggled into Kansas by New England abolitionists. 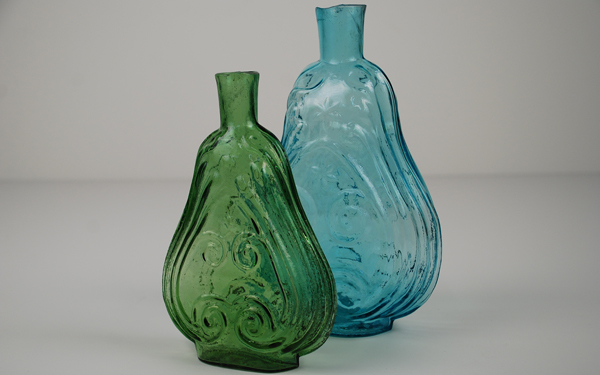 Beautiful blue and green glass scroll flasks from Christian Ihmsen & Sons and a balance scale from the Pittsburgh Novelty Works, just a few of the hundreds of Pittsburgh products shipped west in the 1850s. Barrel lid folk painting of the steamboat New Orleans, celebrating the first steamboat to travel down the western rivers in 1811. 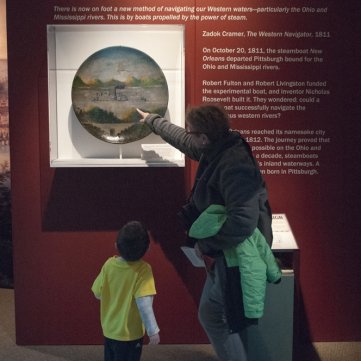 Pittsburgh’s Lost Steamboat: Treasures of the Arabia is on view through Jan. 11, 2014. This aluminum sledge was used in the efforts to help excavate the Steamboat Arabia buried deep below a Kansas cornfield. 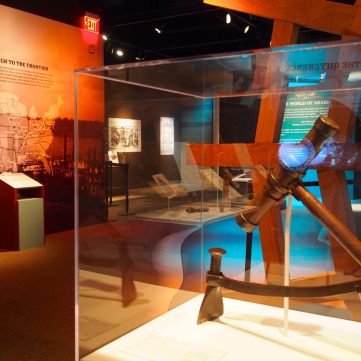 The excavation of the Steamboat Arabia took nearly three months to complete. 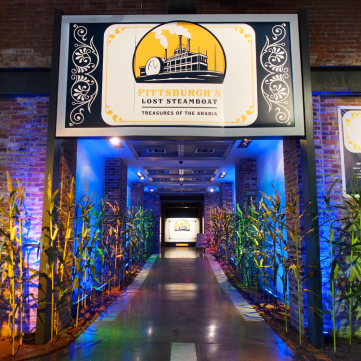 Visitors enjoy learning about Western Pennsylvania’s role as one the nation’s leading steamboat building regions. 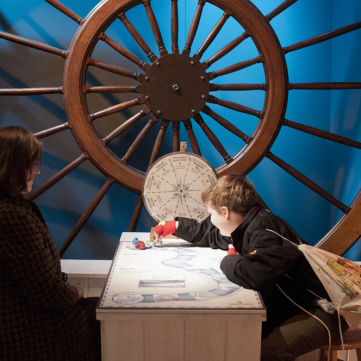 A giant paddle wheel greets visitors at the entrance to the exhibit. 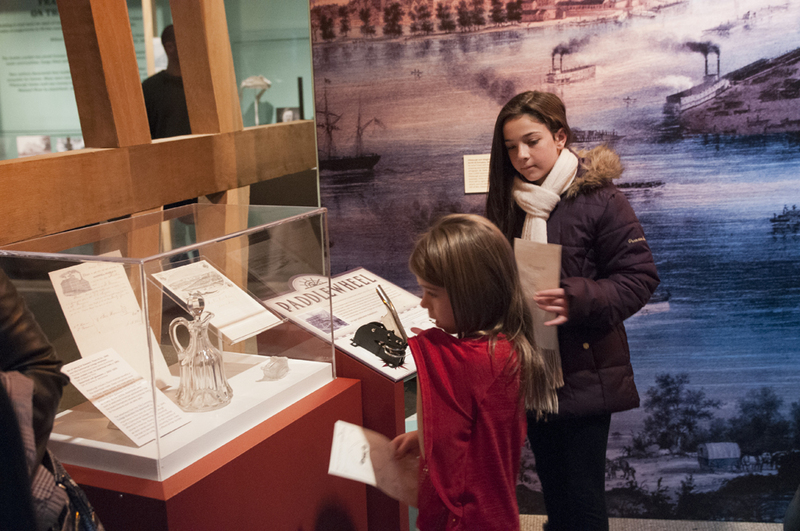 Young visitors can earn stamps for a steamboat pilot’s license. A Pittsburgh entrepreneur, Robert Fulton, built the New Orleans, the first steamboat to successfully travel the Western rivers. 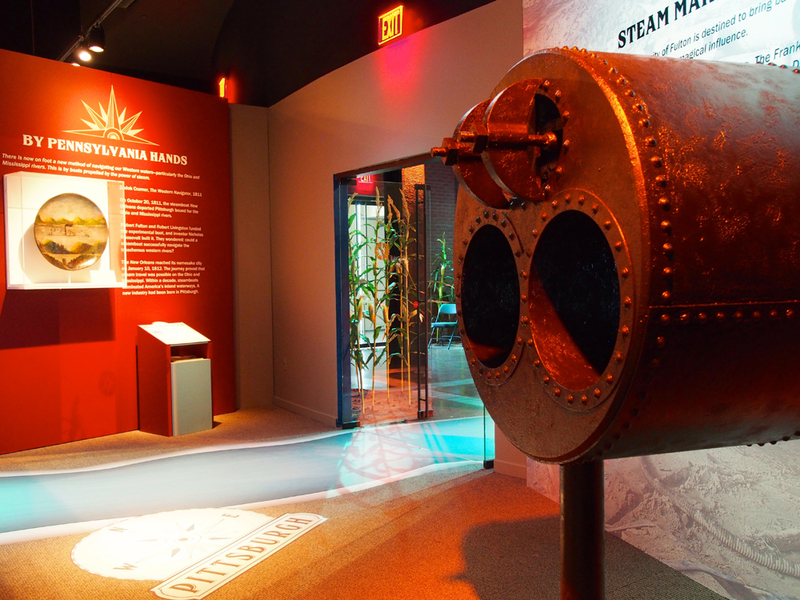 A life-size replica of a steamboat boiler illustrates the massive scale of these floating giants. 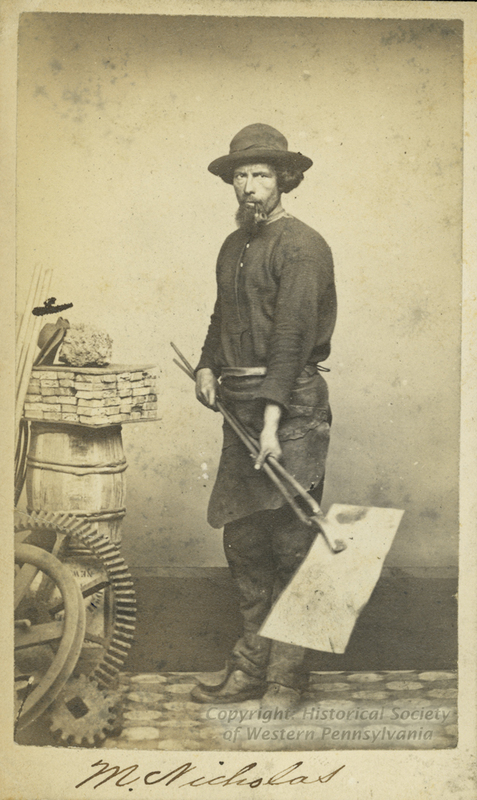 Shipwrights in Western Pennsylvania used a variety of tools to build steamboats in the 1800s. 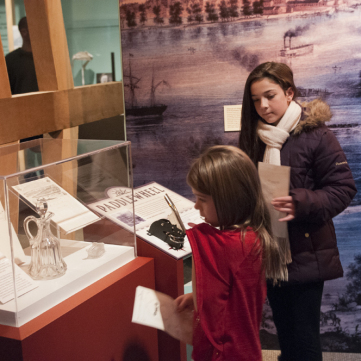 Items from the Bleeding Kansas Debate helped to effect slavery’s role in the West. 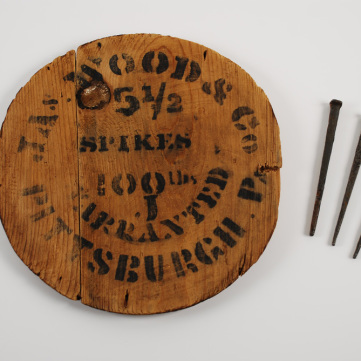 Hundreds of Pittsburgh-made objects were aboard the Steamboat Arabia. 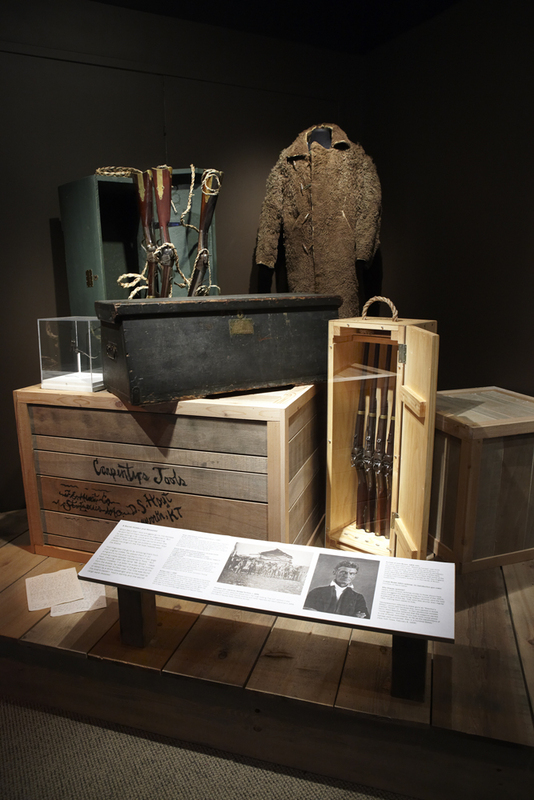 Steamboats carried almost everything anyone needed to start a life on the Western frontier. 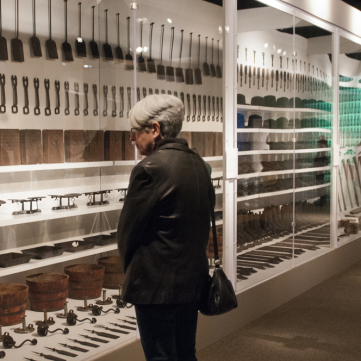 When it sank, the Steamboat Arabia contained more than a million objects bound for settlements in the West. 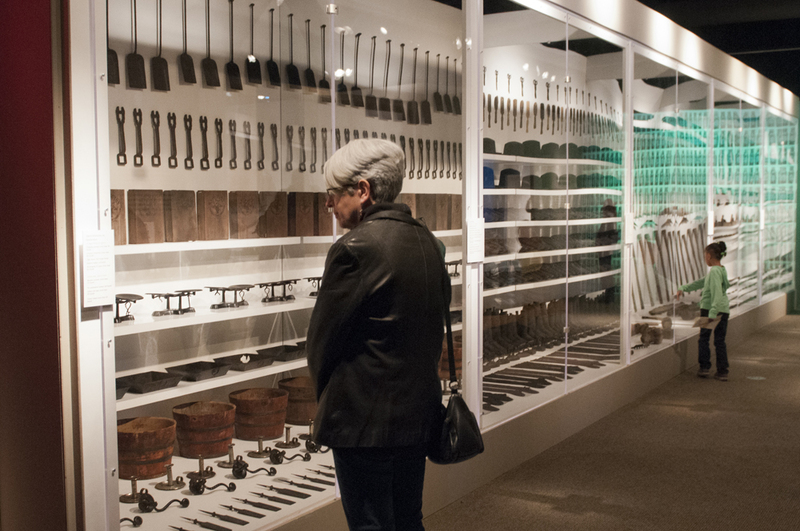 Thousands of tools and everyday items were among the million objects found aboard the Steamboat Arabia. 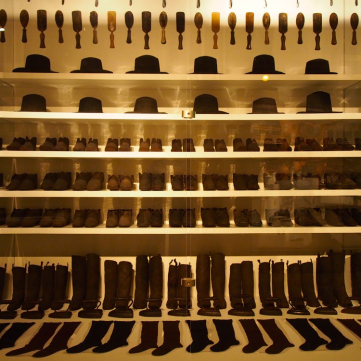 Perfectly preserved hats, boots, and shoes were among the Steamboat Arabia’s 220 tons of cargo. 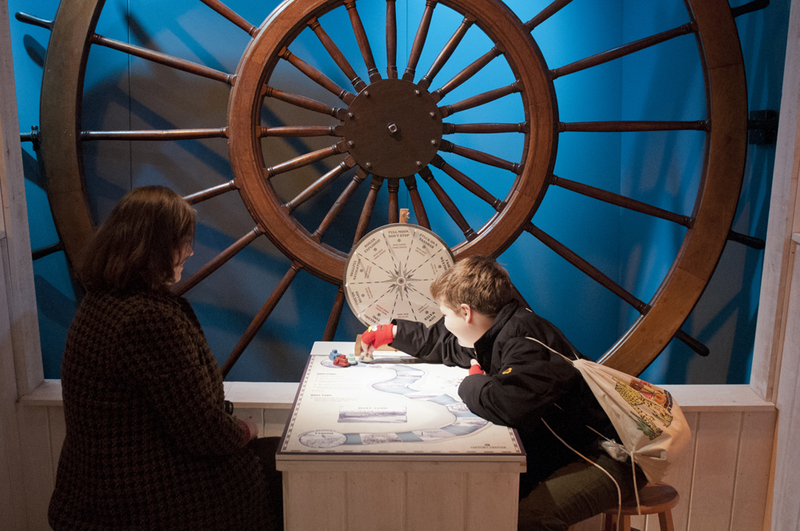 Younger visitors can learn about the perils of river travel as part of a series of hands-on learning activities. Although all of the passengers made it safely ashore, the lone casualty of the Steamboat Arabia’s sinking was a carpenter’s mule. 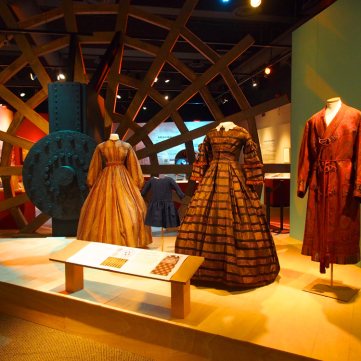 Formal dresses were among the many textile objects found on the Steamboat Arabia. 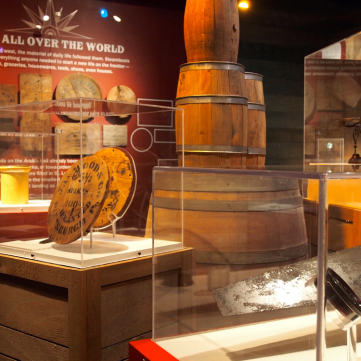 Conservation of the one million objects is an on-going process to preserve these treasures for future generations. 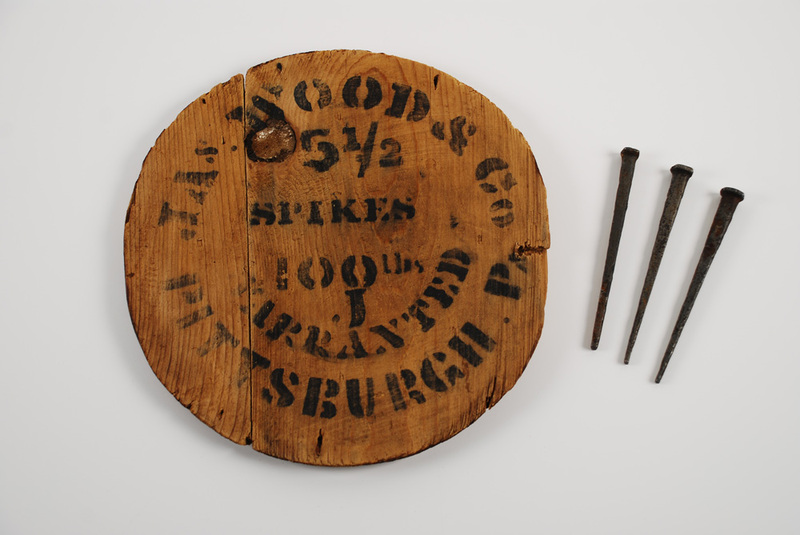 Many objects have been a challenge to properly conserve, such as this pail of nails and set of doorknobs. 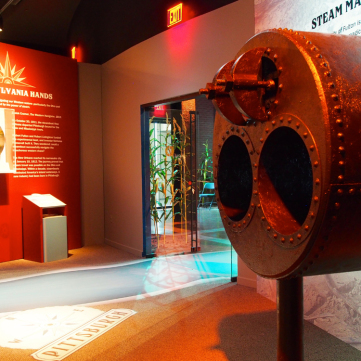 The first steamboat to successfully travel down to the Ohio and Mississippi rivers to New Orleans left from Pittsburgh in 1811. 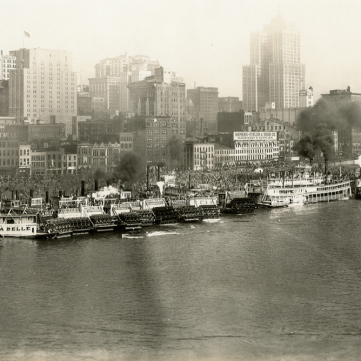 By 1849, Pittsburgh’s wharf welcomed more than 2,000 steamboats every year. The Arabia was only three years old when it sank. 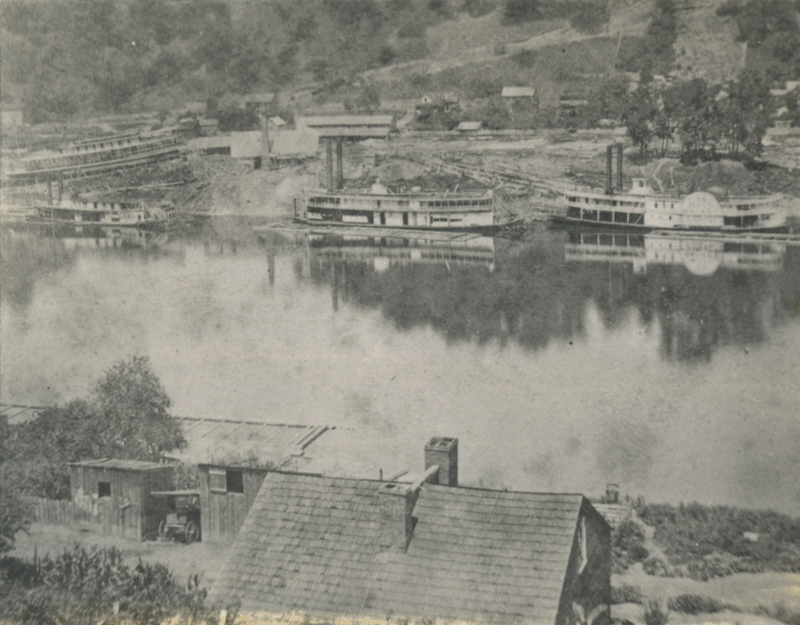 Most western river steamboats lasted less than five years. 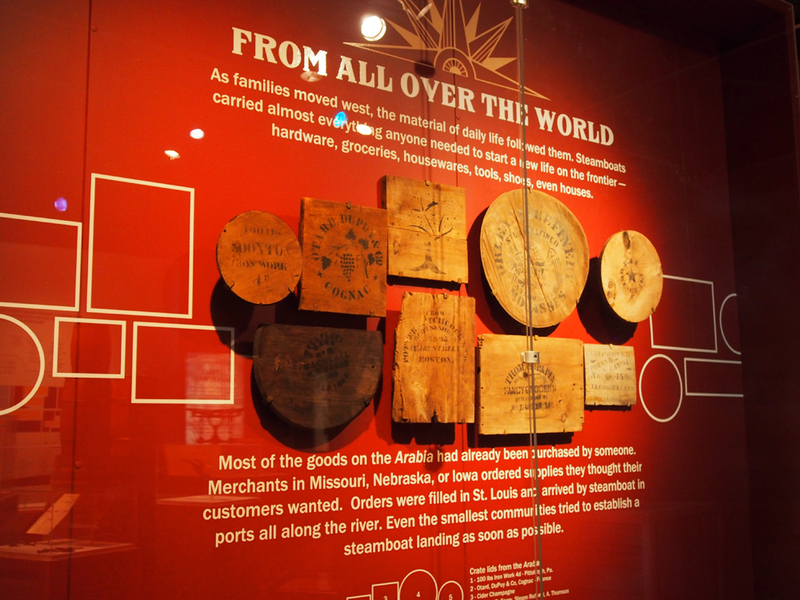 The Arabia’s final cargo included more than 2,000 packages, 10 barrels of whiskey, and two frame houses. 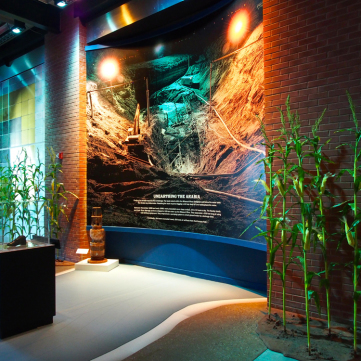 The Arabia’s cargo hold was only 4’7” high, not enough for most adults to stand at full height. 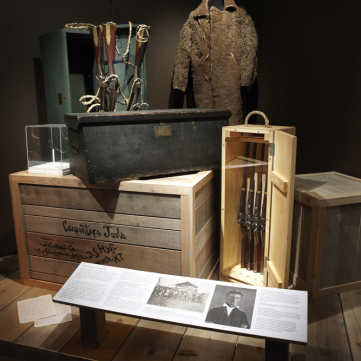 The only passenger lost when the Arabia sank was a carpenter’s mule, left tied to the deck when people fled the sinking boat. If at first you don’t succeed: The Hawley family tried to find and excavate eight other boats before they successfully uncovered the Arabia. Larimer Avenue in Pittsburgh and Larimer Square in Denver, Colorado are named for the same family. William Larimer left Pittsburgh by steamboat for the Nebraska frontier in 1855 and eventually helped found the city of Denver. Scroll flasks made by Christian Ihmsen & Sons. Photo by Elizabeth Simpson. 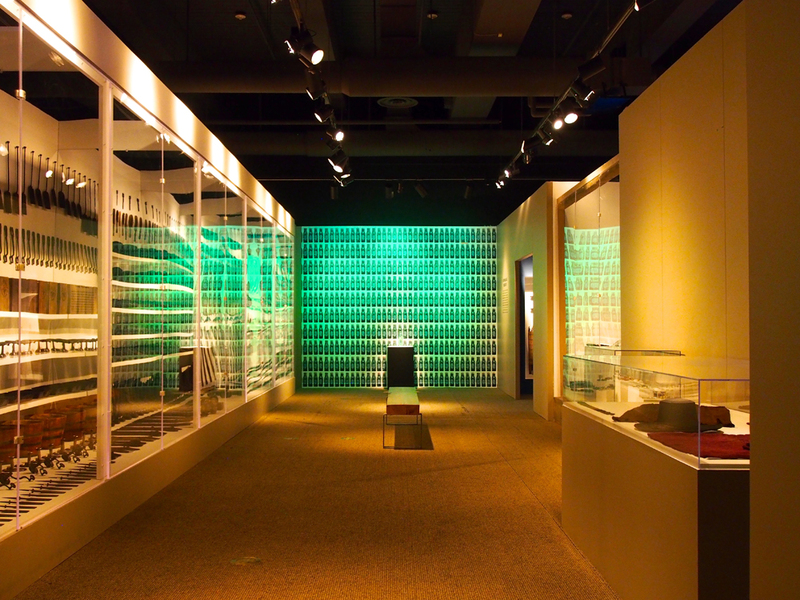 Nearly 100 of these elegant glass flasks were recovered from the Arabia. 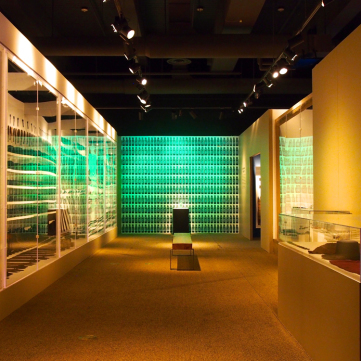 Steamboats carried Pittsburgh glassware and window glass across the western frontier. 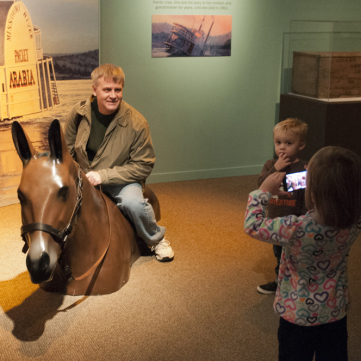 Courtesy Arabia Steamboat Museum. 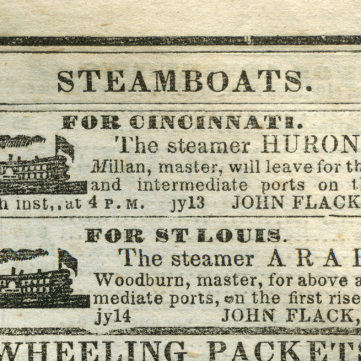 Advertisement for the Steamer ARABIA, Pittsburgh Post Commercial, July 14, 1853. 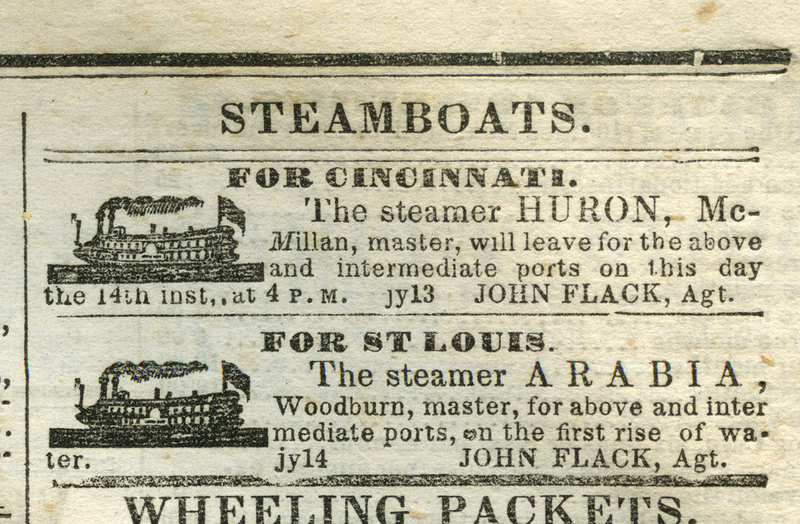 This advertisement announced the Arabia’s services when the boat was running on the Ohio and Mississippi Rivers. 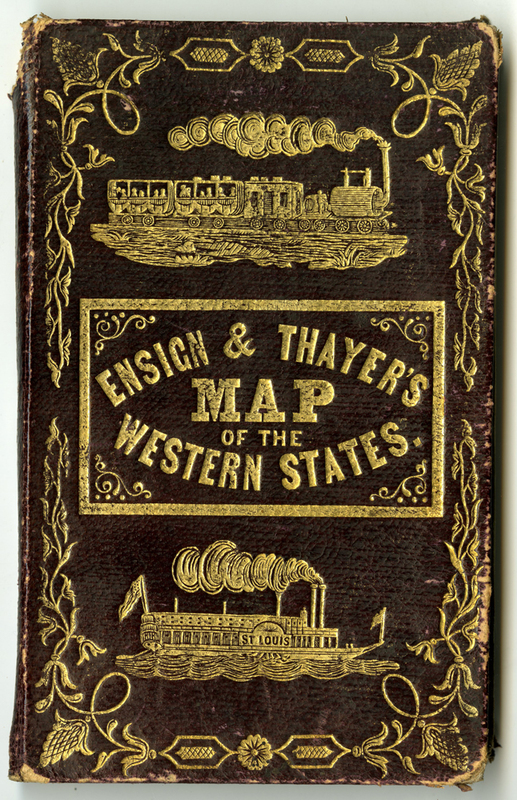 In 1855, new owners switched the boat to a route on the Missouri River. Photo: Detre Library & Archives. 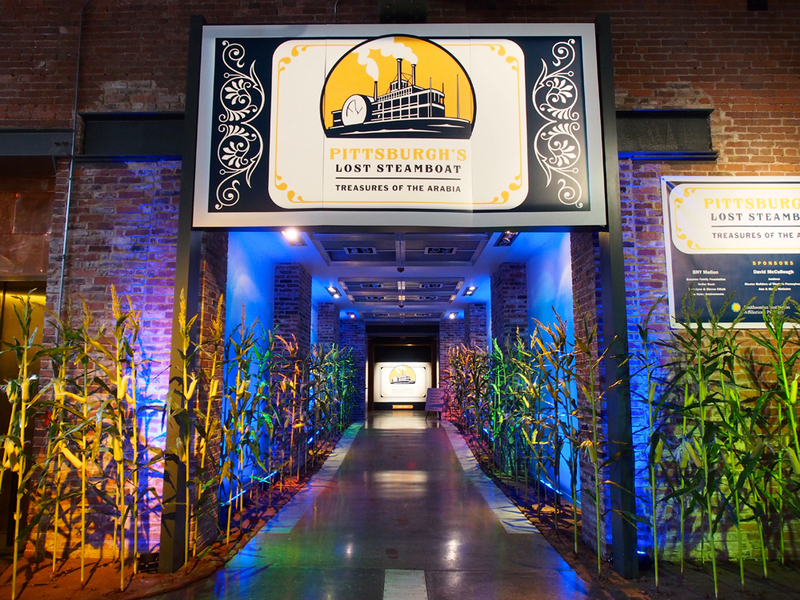 Although the heyday of steamboats as freight carriers ended after the Civil War, they continued to serve other roles into the 1900s. 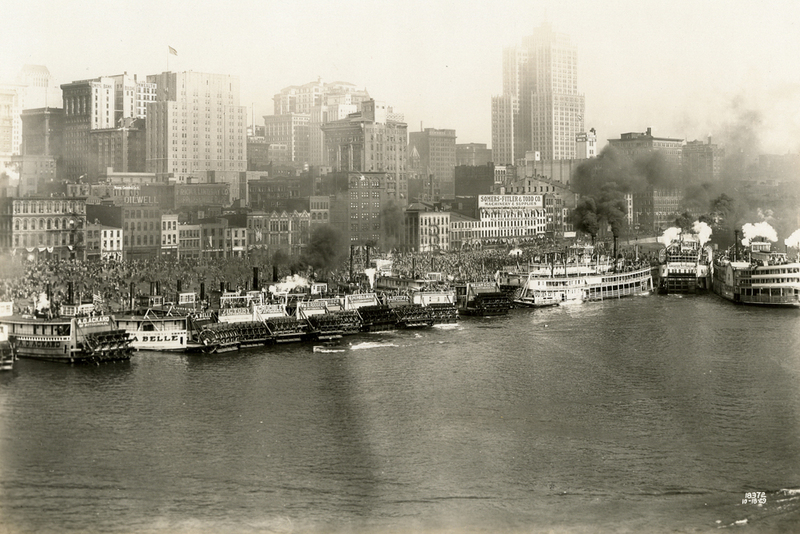 This photo captures the scene in October 1929 when a flotilla of steamboats gathered in Pittsburgh to celebrate the completion of a series of locks and dams on the Ohio River. It’s a glimpse of what the wharf might have looked like 75 years earlier, when the Arabia called it home. 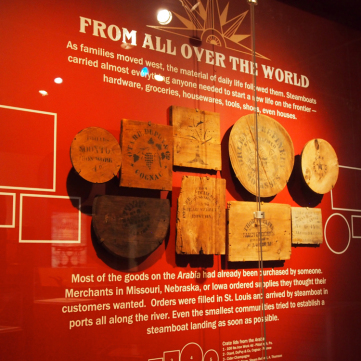 Crates and barrels of iron goods made by Pittsburgh companies filled the Arabia’s cargo hold. 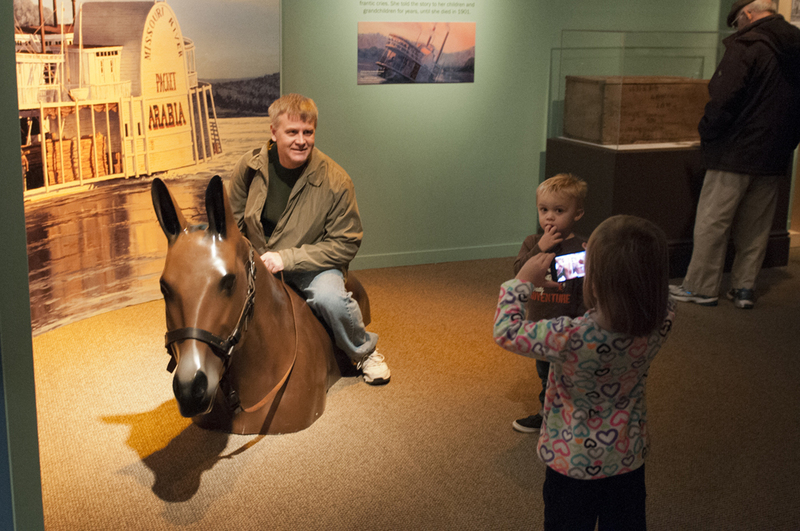 Courtesy Arabia Steamboat Museum. Photo by Elizabeth Simpson. 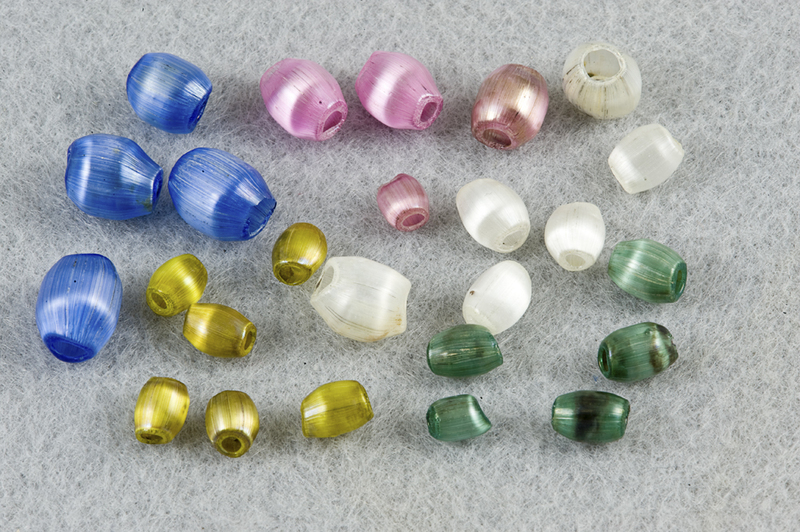 The Arabia carried thousands of blown glass beads in every color and style imaginable. 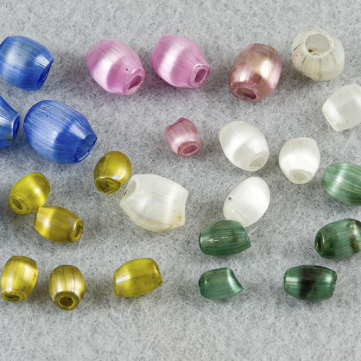 Once recovered, each bead has to be cleaned by hand to restore it to its original beauty. Courtesy Arabia Steamboat Museum. Photo by Dave Hawley. Steamboats and railroads enabled Americans to travel faster across the interior of the United States than they had ever imagined was possible. 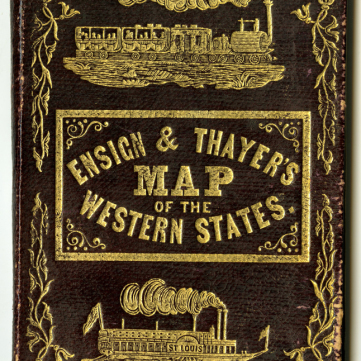 In this traveler’s guide from the early 1850s, “western” included today’s mid-western states of Ohio, Indiana, Illinois Missouri, and Iowa. Courtesy of the Detre Library & Archives. 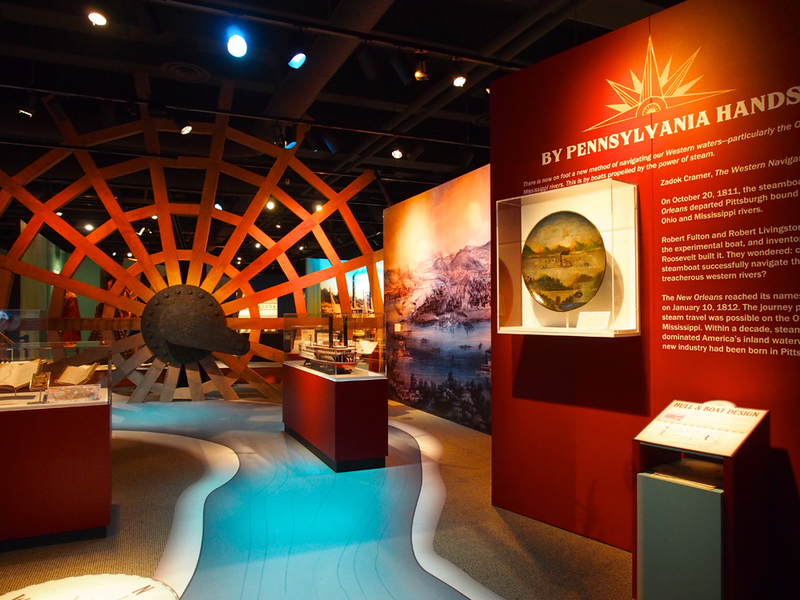 Although this image postdates the era of the Arabia’s construction, it illustrates the kind of boat building activity that filled the Monongahela River Valley through the mid-1800s. Photo: Detre Library & Archives, Steamboat Photographic Collection. 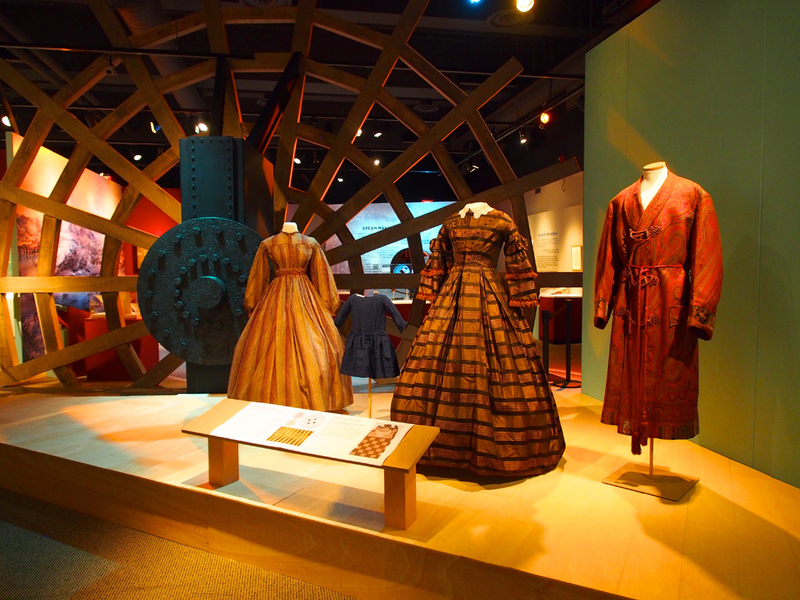 Through the 1800s, workers at Pittsburgh’s Lyon Shorb & Company produced the sheet iron for hundreds of steam boilers just like the Arabia’s. 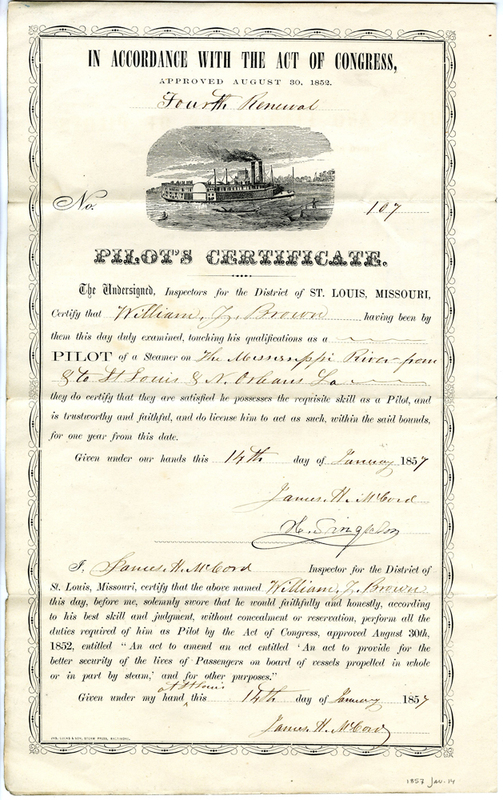 A pilot’s certificate allowed someone to drive a steamboat on rivers for which they demonstrated the knowledge to guide the boat safely to its destination. William Y. 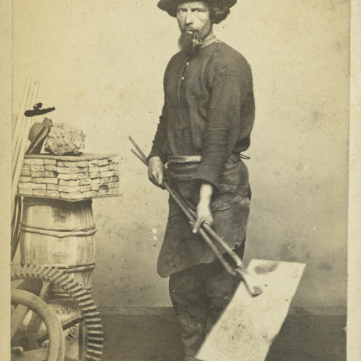 Brown was originally a Pittsburgh resident who started his career on the Ohio River. 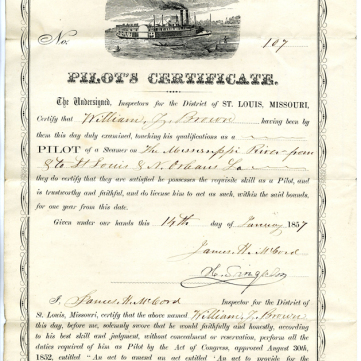 When the owner of the boat he piloted moved its operation to the Mississippi River, Brown moved with it. Detre Library & Archives, Baum Family Papers. 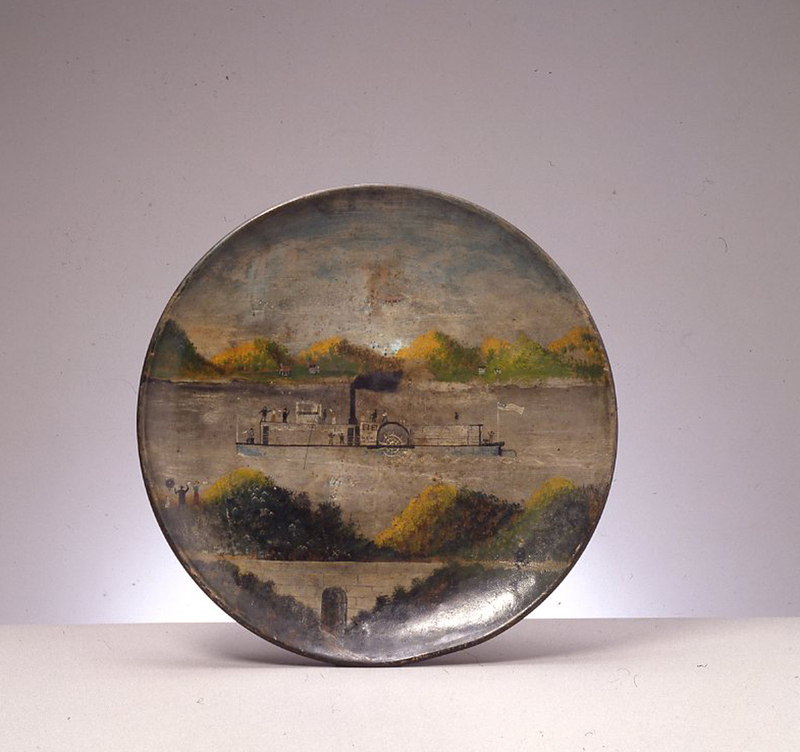 This folk painting on a metal barrel lid captures the local excitement of the historic voyage of the New Orleans in 1811. 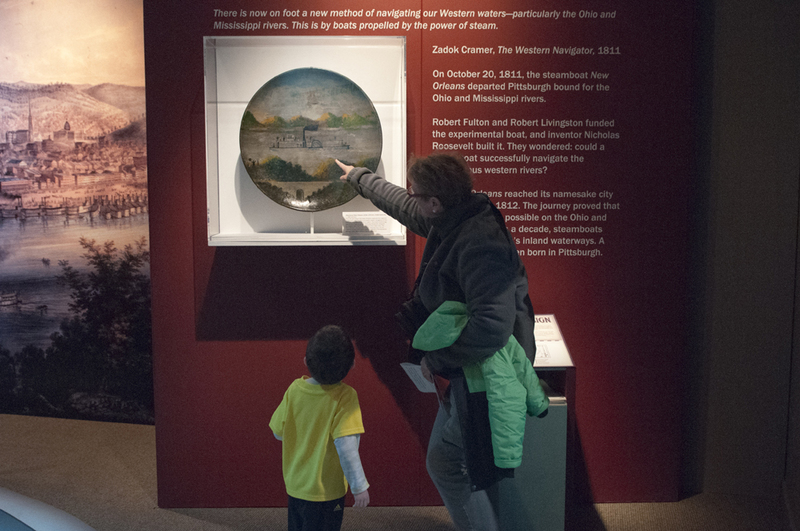 This folk painting on a metal barrel lid captures the local excitement of the historic voyage of the New Orleans in 1811. 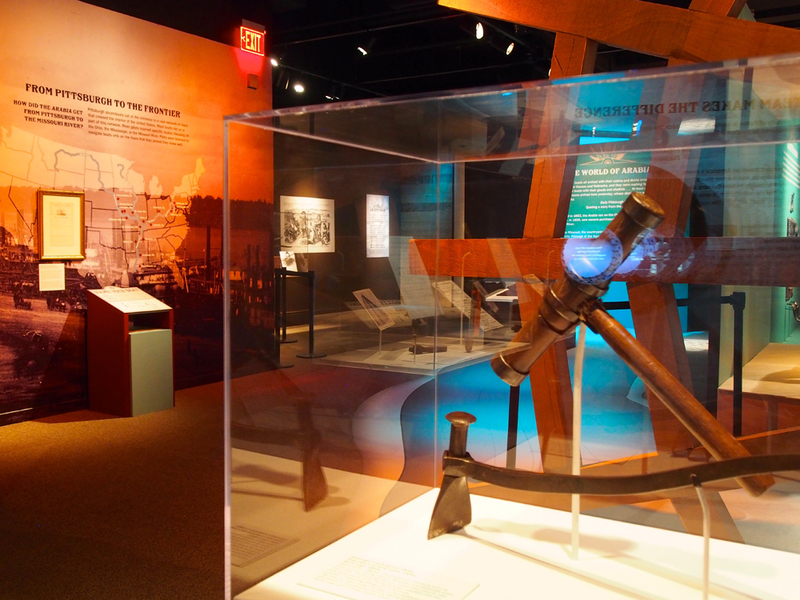 This boat, a project of Robert Fulton, Robert Livingston, and Nicholas Roosevelt, became the first steamboat to successfully navigate the western rivers all the way to its namesake city of New Orleans. Sharps Model 1853 Carbines with Ames saber bayonets. The Arabia’s cargo reflected the turmoil of the Bleeding Kansas debate on multiple voyages. 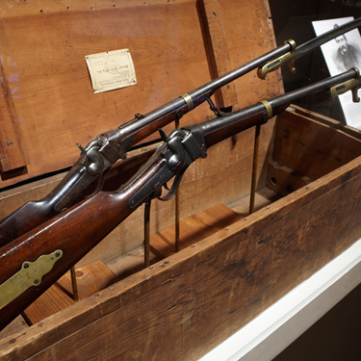 These rifles were sent west by the New England Emigrant Aid Society. To keep the guns out of enemy hands, the order was split. Half were sent overland and the other half sent on board the Steamboat Arabia. 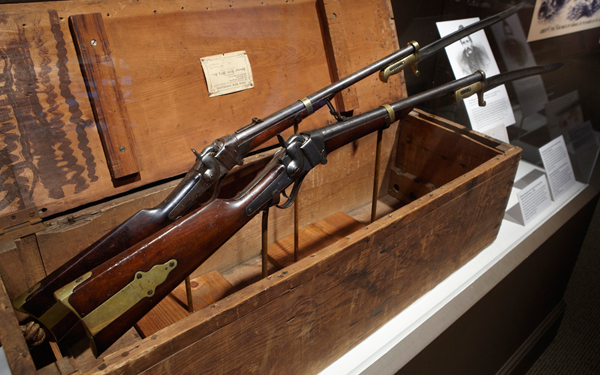 The front rifle, among those in the Arabia, was seized by pro-slavery forces when the cargo was discovered in March 1856. 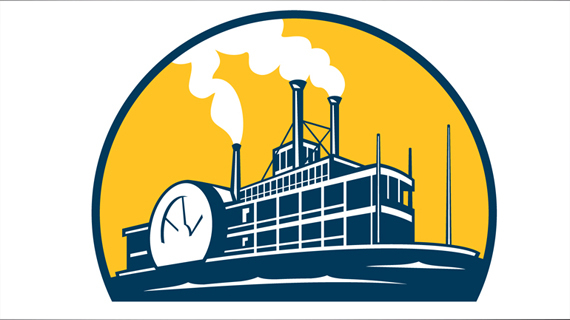 We extend a special thank you to the Hawley Family, Flo and Bob and David and Laurie, their River Salvage, Inc. partners, especially Jerry Mackey and his wife Joan, and the staff at the Arabia Steamboat Museum. 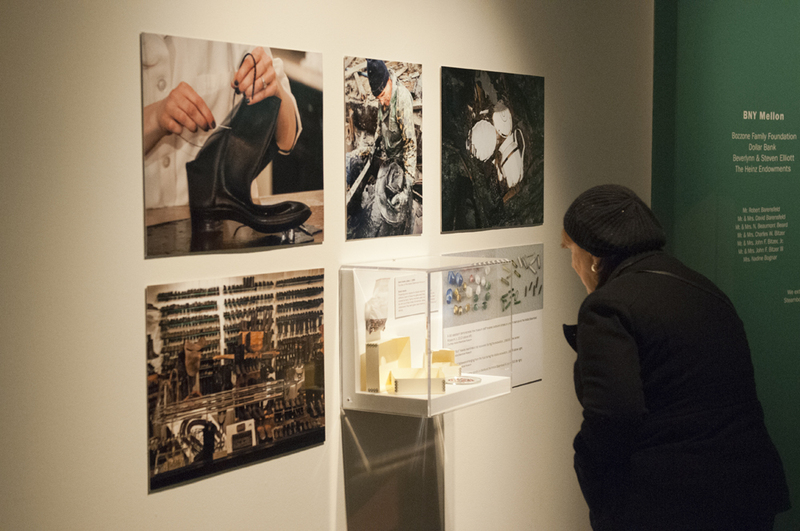 Without their tireless dedication and extraordinary efforts this exhibition would not be possible.